Industrial Demolition LLC is part of a group of corporate affiliates focused on the acquisition, remediation, demolition, and redevelopment of distressed real estate assets in the energy and industrial sectors. Founded in 1991, this group has successfully acquired hundreds of brownfield properties for the purposes of reclamation and redevelopment. Over that time, the group has grown successful in the execution and management of power plant and industrial demolition. Twenty-five years of internal success and an increased demand for demolition services compelled management to transition the services externally. 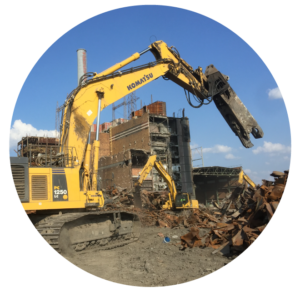 Today, Industrial Demolition LLC has the equipment, labor force, and knowledge base to execute and manage industrial-sector demolition projects of any size and complexity, at any location in North America. To learn more about the experience and strength behind Industrial Demolition LLC, please visit the websites of our corporate affiliates below.